Removes those hard to clean spots! Janie® is non-toxic, non-flammable, and odorless. Made of natural ingredients, Janie® is a powder in stick form. Just rub it on, let it absorb, then brush it away. SO SIMPLE, SO EASY, SO SAFE! 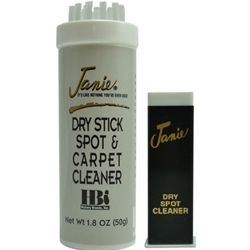 Janie® is made of a combination of clays that absorb the oil in a spot and allow it to be brushed away. IF THE SPOT HAS NO OIL TO ABSORB, THE CLEANER WILL NOT BE EFFECTIVE! Therefore, it will not work on ink, mustard, Kool-Aid, wine, tea, and coffee (unless you take cream with your coffee). It is desirable to remove as much of the liquid oil as possible before applying Janie® since the clays can only absorb so much oil at one time. You can remove excess oil by blotting the spot or by letting it sit long enough to "wick out" into the fabric. If the spot is "heavy" or wet, it will be necessary to make several applications to remove all of the stain. After letting the clays absorb the oil for two to three minutes, brush gently with the brush supplied. IF Janie® DOES NOT REMOVE THE SPOT EVEN AFTER A FEW TRIES, IT STILL WILL NOT HARM THE FABRIC. For delicate fabrics such as Lycra knits or embroidery, it is better to blow the powder from the spot (canned air or hair dryer) or use self-fabric. On dark fabrics, it may be necessary to remove the final residue of powder with a slightly damp cloth.